Really excellent work. The concept and thought put into these is amazing. I'm not a fan of the class name (how about Leviathan or Deep Ones). Guardian sea man could also do with a rename and surely they is no way to use his ability (i.e. can only use when he is already readied). I think you have actually gone insufficiently OP rather than OP. The draw engine as an item (an octopus) seems strange. 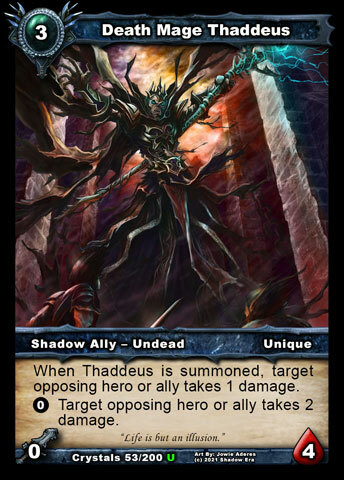 It is also hard to trigger, has low durability and is expensive (turn 3 being a key turn to place an ally). If kept as an item (and made 2CC or 4CC with more durability) I would suggest it also triggers on water damage. Sea crab is the weakest T2 drop and would be replaced with the default human or shadow one every time. Perhaps give it ambush or damage resistance. At present Karash can kill it, layarian knight can kill it. Both human and shadow T3 can kill it in one turn (karash+DMT , Layarian+aldon). Crab+current marine T3 ally can't do anything. Alternatively give it some useful late game on play ability. For example- when summoned cause 1 water damage to an opposing ally (would therefore be generally handy and especially against layarian knight), or target friendly ally has ally negative statuses & attachments removed. Or keep the original ability (+1 resources) but make it a 2,2 or 3,1. Reef guardian should be a 3,4 or 2,5. Tidal blade is very weak since it does not provide control (anklebreaker, DOU) and the class is not weapon based so will probably be inferior to. I would probably make it 2/5 with: 1 durability- opposing ally or hero takes 2 water damage. Alternatively, any opposing ally killed by tidal blade is added to your resource pile, when summoned ally opposing allied lose stealth. Seamail would cause you a lot more problems than your opponent. I would be tempted for it give a bonus to marine creatures instead (e.g. +2 health, +1 attack) or gain a bonus based on marine allies e.g. when you summon a marine ally it has +1 durability. It has +1 defence for every marine ally in play. signature IG message: "the game has already started"
I love coming back to look at these cards. You are a talented guy. Much respect. Host of 130 Pop up Tournaments. 520 free packs awarded!